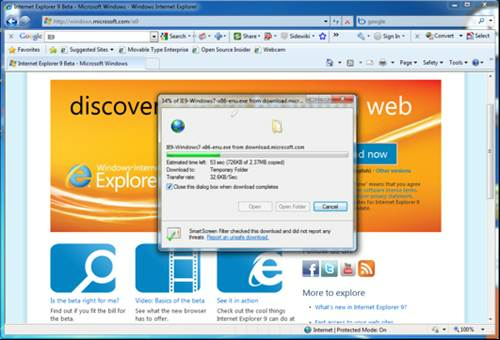 Installation of Internet Explorer 9 is simple without the need for any convoluted Microsoft wizards or wizardry of any kind. Adopting a stripped back approach to its user interface layout, the browser is now more compact with an increased number of functions accessible from drop down menus. The top right of the screen is now populated with a house icon (Home), a star (Favourites, Feeds and History) and a tools 'cog' icon (Print, File, Zoom & Safety options as well as Internet Options and Developer Tools).